We are very pleased to welcome Mrs Sandy Ingram as part of our team. 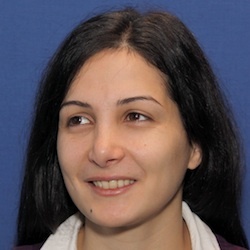 She received her degree in Computer Engineering from the Lebanese American University, and earned the president award for having graduated with the highest cumulative GPA. Sandy pursued her PhD in Computer Science at EPFL here in Switzerland then worked as a scientist in the REACT research group at EPFL for two consecutive years. Her research was focused on recommender systems for collaborative websites and online personal learning environments. Sandy wrote more than 10 publications including conference papers, book chapters, and journal articles. She developed along with other colleagues from REACT, two websites (namely eLogbook and Graasp ) dedicated to resource sharing, collaborative work and personal learning. Sandy has worked on several European projects and networks of excellence including PALETTE, ROLE, and STELLAR. She also managed the Jumpers CTI project aimed at developing a recommender system for online job hunting. At Klewel, Sandy will be involved in both Triskel platform development, and research projects: inEvent and Aroles. Singing and biking are her favorite activities; the best is when she combines both in family biking trips, though, as she tells, this combination is not always fun for other bikers !